It may be spring, but there’s “Snow” in the forecast for health care assistants in BC. But not just any snow – Teepa Snow. SafeCare BC is pleased to announce that Teepa Snow, one of the world’s leading advocates and educators for dementia care, is coming to Hearts and Hands, October 22 and 24. Teepa’s advocacy efforts led her to the development of the GEMS® dementia classification model and the Positive Approach® to Care training strategies. Teepa is an occupational therapist with 40 years of rich and varied clinical and academic experience. She presents with extraordinary expertise and humor to audiences throughout the world. Hearts and Hands is the premier annual conference for health care assistants in BC, with the goal of celebrating, educating, and inspiring. Last year’s conferences in Victoria and Penticton were hugely successful, with 245 frontline continuing care workers in attendance. The 2019 conferences will be held at the Coast Hotel & Convention Centre Langley on October 22, and the Songhees Wellness Centre in Victoria on October 24. Download the 2019 Conference Poster. Registration opens April 29th and with a speaker like Teepa Snow, tickets won’t be available for long! This year’s Hearts and Hands conferences will feature three breakout sessions. SafeCare BC is currently accepting abstract proposals from prospective session speakers. Desired features: Interactive, engaging, and thought-provoking. Participants should leave feeling empowered to take action. 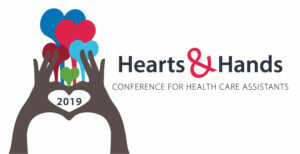 Abstract proposals can be submitted using the 2019 Hearts and Hands Conference Call for Presenters form. For more details on submission requirements and conference information, please refer to the Call for Presenters form.